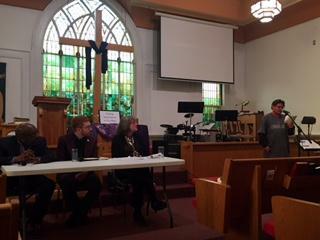 Faith Voices of Columbia hosted a Ward 1 City Council Candidate Forum Thursday night to discuss solutions to poverty and homelessness in the area. Candidates Andrew Hutchinson, Pat Kelley and incumbent Clyde Ruffin gathered with community members at the Wilkes Boulevard United Methodist Church to discuss solutions to the poverty and homelessness and Ward 1. Faith Voices of Columbia organizer Alice Chamberlin says the purpose of the event was to make sure city council candidates had these issues at the forefront of their minds. Community members shared testimony and candidates were asked a series of questions around the topics of increasing employment opportunities, creating more affordable housing, and repairing and maintaining infrastructure. David Robertson was a community member who spoke about the difficulties he has had when trying to find a job. Roberson said that more needs to be done to help felons find work. This was the first of many conversations the group plans to have. Chamberlin says Voices of Faith in Columbia hopes to increase voter turnout in the First Ward by the April 4 election by organizing conversations by knocking on doors and making calls.